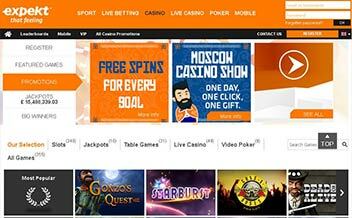 Expekt Casino was founded in 1999 and operated by Beltic Everest group. It saw a stable growth initially especially when poker was launched in 2003. Expekt Casino main customers are from Germany, Czech Republic, Sweden, and Poland. Since it was first established in 1999 Expekt Casino has acquired a lot of respect among the players. it has more than 1.5 million customers in over 150 countries worldwide. Its vast list of online games and promotions has made it grow more. There are close to ten jackpot slots at Expekt, including all the usual suspects like Hall of Gods, Cosmic Fortune, Mega Fortune, and Mega Moolah ensuring the big players are drawn in. Most games can be enjoyed for play-money first without the need to register an account. 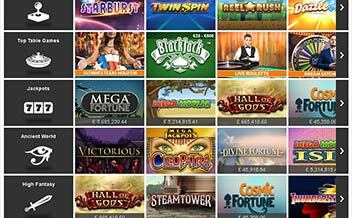 Expekt Casino provides online slot players a variety of slot games. Players are able to vote for their favorite slots through a five-star scoring system. Games are filtered by rating. The netent fare is present at the site and includes old and new video slots like Jack Hammer. The casino has also ensured that table games fans are taken care of, it has a variety of Blackjack games, Roulette games, and Hold’Em games. Other games include Vegas Craps, Punto Banco, Baccarat, Red Dog, and Pontoon among others. The casino also offers a vast list of live dealer games to ensure that players get to enjoy the casino experience without visiting the actual casino. Players get to interact with the live dealers. These games include; Dream Catcher, Roulette, Live Baccarat and Three Card Poker among others. New players at Expekt Casino can earn up to €200 in matched cash when they make their first deposit. Betting requirements differ in nature depending on where the player comes from. Expekt Casino has a variety of promotions running throughout the week. The site gave away a sports car as part of its Race Roulette promotions. Expekt Casino has the best software for its vast list of games, the games are of different themes giving players a sense of adventure and calm experience. 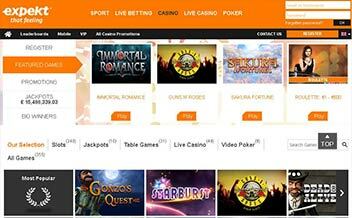 The software providers include; NetEnt, Genesis Gaming, Microgaming, ThunderKick and OpenBet among others. Credit or Debit card, Skrill, Neteller or PaySafeCard. It is recommended that a customer uses Neteller for convenience, speed, and security. Mobile, instant play, and Download. The casino restricts these countries from accessing the casino; South Africa, Australia, U.S. Miscellaneous Pacific Islands, United States and U.S. Virgin Islands. Currencies accepted by the casino include GBP, CNY, CZK, DKK, EUR, HKD, HUF, ISK, IDR, MYR, NOK, RUB, SGD, SEK, CHF, THB, USD, UAH. Languages used by the casino include; Slovenian, Chinese, Polish, Czech, Danish, Russian Estonian, Croatian, English, French, German, Hungarian, Turkish, Italian, Norwegian, Swedish, Latvian, Slovak, Spanish. Expekt Casino is available for both mobile devices and pc. Also, players can access the casino through a web browser. The web version provides customers with all the games the casino has to offer. All major web browsers are supported. They include Chrome, Firefox, and Opera just to mention a few. The Expekt website is easy to navigate through the variety of games provided. There are not less than 30 different games that include Slots, Live Games, and Table Games. There is a broad menu at the site that simplifies the navigation process for players. The interface is user-friendly. The desktop version of the casino is quite similar to the web version. The mobile version of the casino software lets the player play the casino games instantly. You can play right from your mobile device anywhere. The casino has put in security measures in place to ensure they protect their customers. Players identity and financial information are also protected. The casino has also put in place the latest computer safety and firewall technology systems to boost security. Expekt Casino is no different when it comes to offering 24hour customer support. Live Chat service is available 24 hours on the website. Email and phone services are available for the UK and overseas clients. There is a provision of Live streaming. A variety of bonuses available. Credit card deposits are normally charged. Expekt Casino is not yet a premier venue, although they are currently working to better their offers and services. Be part of the casino today.